That word six-pack has a lot of connotations. One of my newest uses of the term relates to a pack of hot asian buns. 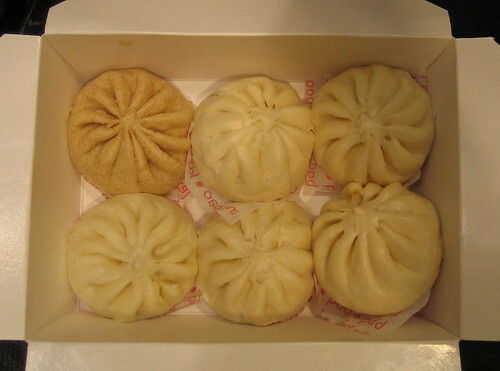 I got a six-pack of baos the other day from Wow Bao in Water Tower Place. What you see above is 1,035 calories worth of baos; one vegetable, one chicken terayaki, two kung pao chicken, and two bbq pork. My wife and I shared them on a random bench in the mall and it was so romantic. Well, it was romantic until she got sick of me saying “I like to chow on a kung pao bao.” Go ahead, say it, it rhymes. 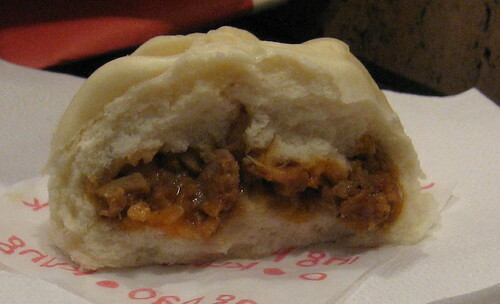 I like to chao on a kung pao bao. Yeah, Gail didn’t think it was very funny either. The pastry surrounding it is fluffy and moist. I wouldn’t mind a little more kung in the kung pao (I wanted it spicier), but it’s still damn good. Each one is about 1/2 the size of your fist and takes about 5-6 bites to get down. The filling is strangely evenly distributed in the bun, which is a marvel of culinary science. I can’t find a seam in it anywhere, it’s wild. It’s like a sandwich, but no mess because the filling can’t fall out of the side. You’re probably thinking that they got the protein to starch ratio all wrong because there’s so much more bun than filling. But that’s not how it seems when you eat it because the pastry is pretty light, so it doesn’t overpower the filling. I’ll tell you what they need; they need some dessert baos. How about a strawberries and cream filled bao or a Nutella filled bao? If they did, I would get a six-pack of four savories and two sweets, then top it off with a cup of coffee. Man, that would be good. Posted in food on 2007/09/13 by John.